"The Queen of the Air, conveying Mr. Seth Simmons, Jr., who was in charge of the balloon, and Mr. E.B. Haskell, one of the reporters for the Herald, arose almost in a straight line for some distance, when an upper stratum of air caught it and it was wafted over East Boston, and seaward toward Nahant. Ballast was thrown out, and the balloon ascended higher, but the current of air, which baffled a few points off and on, still tended eastward and seaward. Under such discouraging circumstances it was thought best by Mr. Simmons to try and lower the lower strata of the atmosphere again, and a sufficient quantity of gas was let off for that purpose. But the wind remained firm from a western direction, and seeing some small vessels in the water below, it was determined--rather than run the risk of descending involuntarily on the broader surface of the Atlantic--to come down and rust to Providence for safety. Just as the balloon was about to touch the water, it encountered the light breeze playing along the crest of the little waves, (for the ocean was unusually calm,) and it was first slowly, and afterwards with great swiftness, dragged along the surface. Messrs. Simmons and Haskell were both thrown down at the moment the basket touched the water, and the latter was hove out. Mr. Simmons seized hold of the hoop, and, more than half immersed in the water, wad dragged along. Mr. Haskell caught one of the lanyards pendant from the top of the balloon and held on to it with most tenacious grasp. He was assisted by Mr. Simmons, and was dragged through the water for a couple of miles, which distance accomplished--according to the account given by the parties who were instrumental in their rescue--in the space of ten minutes. 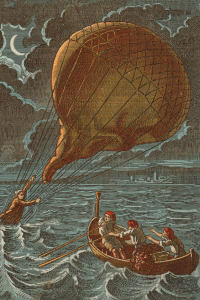 Providentially, the crew of the schooner Atlantic, bound to Bangor, saw the accident to the ballo0n, and put about to intercept it in its career over the ocean; and specially providential was...that the schooner was directly in the way of the balloon as it came along, which drove it up against her stem. At the moment of contact, Mr. Simmons let go the basket, and succeeded in getting on board the schooner. Mr. Haskell was forced by the concussion to relinquish his grasp of the halyard of the balloon, and he drifted astern. But, being a good swimmer, and, above all, having good heart in his great extremity, he threw himself on his back, allowed himself to float on the tide, without making any effor to swim back to the schooner. He felt confident nothing would be left undone to accomplish his rescue at the earliest possible moment--and it was well; for had he struggled during half the time he was subsequently fated to be in the water, he would having exhausted himself and been drowned. The schooner's crew lowered a boat to go to the rescue of Haskell, but in the haste of doing so it was swamped, and one man who was on board pitched out. He unfortunately drifted in the opposite direction from that in which Mr. Haskell was floating, and the crew of the Atlantic had to bail out their boat as save their own companion before going the rescue of Mr. Haskell. By the time preparation was made to go after him with a boat, Mr. Haskell had been nearly three-quarters of an hour in the water. But the yacht Mist, which happened to be cruising in the neighborhood, and whose crew saw the accident and Mr. Haskell's extremity, came up before the boat from the Atlantic reached him, and picked him up. He was somewhat tired, but not over-exhausted. The Mist also took off from the schooner has companion-voyager in air and water, and carried them to Nahant."